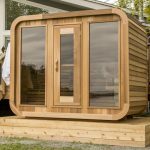 The unique shaped Luna Outdoor Cedar Sauna comes in various sizes and perfect to use all year round. The big windows are perfect to view the pool, mountains or lake. Canadian made.